These drawings make up two of the five drawings of the Senses 'which Mr. West made for the Princess Royal , to make an Etching from'. 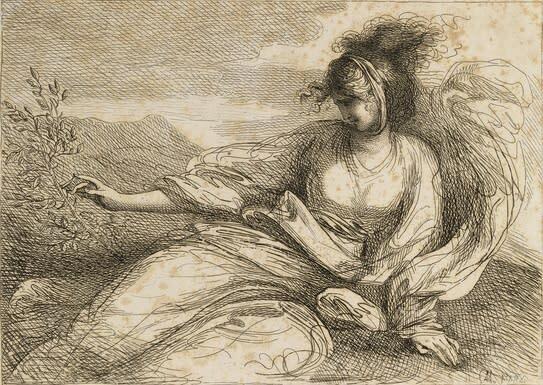 Another from the series, Sound, is also signed and dated 1784 (H. Shickman Gallery, New York 1968) . They were etched by Charlotte Augusta Matilda (1766-1828), the eldest daughter of King George III, who later became Queen of Wurtemberg. An album of prints assembled by Alexander Bennett in the first half of the 19th Century contains a set of these etchings (British Museum 189b. 23). George III's commission in 1769 of the Departure of Regulus marked the beginning of a long period of royal patronage for Benjamin West. During his tenure as Historical Painter to the King, West had studios both in Buckingham House and in Windsor Castle, and from c.1780 to 1809 he rented a house in Park Street, Windsor. He painted many portraits of the royal family, and for a time served as a drawing master to the princesses. The Princess Royal made a group of five lively etchings, dated 1784, which allegorise the senses and were all copies of designs by West. The Princesses were apparently taught to etch by Biagio Rebecca and Peltro William Tompkins.The resulting prints were presumably distributed as gifts to family and friends, in the same way as Queen Victoria and Prince Albert distributed their drawings and etchings in the 1830s and 1840s. 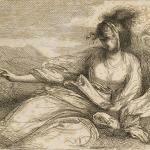 Etching was particularly suitable for amateurs because of its similarity to drawing. Very little pressure was required, and the etcher was able to sketch freely through the waxy ground upon the plate with an etching needle, as though with a pencil. It is not known where (nor by whom) the plates were 'bitten' and printed. By the end of the reign there was a small printing press at Frogmore, some elements of which - in an earlier location - could possibly have been used to print the Princesses' etchings. American-born Benjamin West was one of the most prominent artists in late eighteenth century London. President of the Royal Academy from 1792 until his death, he received many commissions from George III and other English patrons, and at the same time served as teacher and advisor to three generations of American artists in London. He was born in Springfield, Pennsylvania, near Philadelphia, on October 10, 1738. His earliest paintings were portraits of children, Robert and Jane Morris (c. 1752; Chester County Historical Society, West Chester, Pennsylvania). His exceptional talent was quickly recognized, and he painted portraits in eastern Pennsylvania and New York City (briefly), influenced by the work of John Valentine Haidt, William Williams, and John Wollaston. He went to Italy in 1760 to continue his study of painting and after three years, spent primarily in Rome, Florence, and Venice, he settled in London. West worked primarily as a painter of historical and religious subjects, and as a portrait painter as patronage required. The first pictures he exhibited in London at the Society of Artists in 1764 were subjects from Renaissance literature, and within a few years he painted several classical subjects. George III then commissioned The Departure of Regulus from Rome (1769; Queen Elizabeth II), marking the beginning of royal patronage of West, who painted some sixty pictures for the King between then and 1801. West is best known for his influential history painting, The Death of General Wolfe (1770; National Gallery of Canada, Ottawa), exhibited at the Royal Academy in 1771. A milestone in English and American art, this was the first major depiction of a contemporary event with figures in modern clothing. Its subject matter was the heroic death of an English general in battle against the French in Canada. Two later paintings with American subjects were Penn's Treaty with the Indians (1771-1772; Pennsylvania Academy of the Fine Arts, Philadelphia) and the unfinished Signing of the Preliminary Treaty of Peace in 1782 (1783-84; Henry Francis Du Pont Winterthur Museum, Winterthur, Delaware). In the 1770's West subject matter began to include the religious themes that dominated his work of the late 1770's and 1780's. Most notable were his paintings on the progress of Revealed Religion for the Royal Chapel and designs for stained glass for St. Georges Chapel, both at Windsor Castle. Other commissions for Windsor included family portraits and eight paintings from English history for the Audience Chamber. As George III withdrew his support in the 1790s, William Beckford became an important patron, and commissioned religious paintings and portraits for his Gothic Revival country house, Fonthill Abbey. West died in London in 1820. The extraordinary stylistic and compositional differences between West's American and English work are due very much to his three years of study in Italy, when he absorbed the painting styles and compositions of Italian Renaissance and baroque painters, as well as those of his contemporaries. Later, as West became a pivotal figure in educating American-born artists in England, this knowledge in turn transformed the work of his pupils. Americans who studied with West before and during the Revolution included Matthew Pratt, Charles Willson Peale, and Gilbert Stuart. Among his students in the 1780s were Ralph Earl and John Trumbull. These and later Americans, including Washington Allston and Thomas Sully, brought West's ideas and techniques back to the United States, providing a foundation for the growth of the arts in America in the Federal period and creating a late eighteenth and early nineteenth century American style of considerable sophistication.